Here's what they look like now, I added the green gem on the jetbike canopy and on the rider's chest too. You guys were right, it helps finish the model off. I'm going to try for some better pics against a different color background so you get a better idea of the true colors. Now that I look at the photo again, I think I may make the two gems on the wings green as well for visual balance. That and I need to highlight his face mask just a little more too. Now I'm getting into the small details. 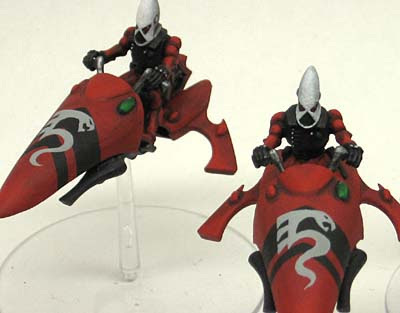 Yeah, the gems make all the difference for Eldar units. It just makes them look perfect. Great job on these. Curious if you thought to grab up another of the Windrider Hosts that GW has in their 'get it while it lasts' section. Saw they still had em and though of your list! Lookin crisp now! I like the darker ruddier red for em now. Looking good! I have to ask are the symbols transfers or painted? If they are transfers how did you get them to look like that? Thanks guys, I didn;t think the gems made that big of a difference until I saw them finished. Marshal Argos: The canopy striping and the symbols are all freehand painted. At first glance they are all close enough to look the same but if you look close, each one is slightly different in shape and size. Excellent. Seems like you're getting trough them pretty fast. They look great! What, about a million left to do? Not quite a million... only 27 total and I have almost 6 done already. I'm really hoping to get the whole army done quick so I can get playing. Peter: Gems are easy, they just take time to do. I'll see if I can find something like a step by step. These are looking great so far Ron! You must be very pleased with the outcomes. Painting up the extra gemstones will only make the end result better. jabberjabber: They are coming out ok.
To be honest, I'm enjoying how fast they paint up compared to my other stuff and the slightly darker look has allowed me a little more freedom as well.